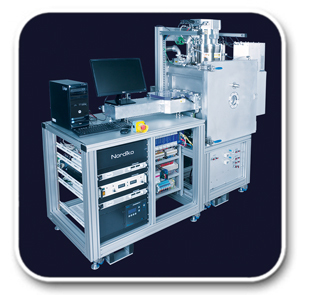 Building on twenty years of experience in delivering RF based ion beam systems Nordiko introduces the α120. This laboratory system comprises a vacuum process module, mounted on a cabinet housing supporting power supplies and power management systems. The system is configured for atmospheric cycling to load samples. The process module comprises an isolated vacuum chamber housing a broad ion beam source and single platen substrate table. The ion source may be used to project a beam, normally of Argon ions at beam voltages from 100 to 600 V. In the path of the ion beam is a substrate table that provides on-axis rotation of the illuminated substrate and can be presented to the path of the beam at a variable incidence angle. High capacity dry pumping group.